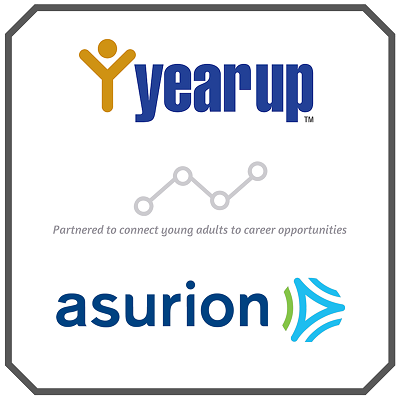 For nearly two years, the Sterling, VA office of Asurion has partnered with Year Up, a nonprofit organization providing young urban adults resources and tools to build a career path. The one-year program offers six months of training in a technical setting, learning and developing skills, followed by a six month, paid internship. We spoke with some of our current and former Year Up interns, who come from all over the world – Virginia, Ohio, the Philippines, and El Salvador – to get their perspectives and reflections of their time through the program with us. Brenda Lovo: Brenda interned on a team conducting tests, automation, and robot testing. Brian Samson: Brian interned in a Quality Assurance role. Now, he is a Manual SQA Associate employee with Asurion. Bryan Watson: Bryan interned and is now an Asurion employee with the Quality Assurance team. Crystal Price: Crystal interned as a Business Analyst/Project Manager. She is now a Technical Analyst with Asurion. How did you hear about and become involved in Year Up? Crystal: I heard about Year Up through my roommate, who worked at a telecommunications company partnered with Year Up. When I first heard about the opportunity, I knew I had to apply. Brian: I heard about Year Up through my father. He worked for a company that had Year Up interns and was surprised by how professional and knowledgeable they were at a young age. I researched the program for myself and thought it would be a great opportunity for me to explore the IT field, while being in school. Bryan: The Deacon at my church is very familiar with the Year Up program and knew that I would be a great match. We attended an open house session and I promised him that I would make it through the program. Brenda: A couple months after I graduated high school, I heard about the program through word of mouth. I researched it and found out that not only do you get technical training, but real world experience. How did you get started as a Year Up intern with Asurion? Crystal: I became a Year Up intern at Asurion in January 2015. After four months of training in my first role, I transferred to a different team, where I finished my internship contract. After graduating the program, I became a full-time employee in July 2015. Brian: After a meet and greet with QA Managers, I was accepted into the internship program. In the first half of my internship, I learned basic manual testing terminology and processes. In the second half, I learned the automation framework. It was a great experience learning both sides of testing and it really gave me insight to what I was going into. Bryan: I started with the QA team doing automation. Within the first two weeks at Asurion, I was teaching my teammates how to automate their tests, as well. Brenda: To become a Quality Assurance Engineer because being able to quickly find bugs and issues is important to any business. Having an eye for design and functionality is something that I possess. I also plan on becoming a freelance front-end designer, as it’s a passion of mine. Bryan: To advance myself as much as possible. I have no plan of action written in stone. I have learned that life is too unpredictable to have a narrow perspective of the future. However, my short-term goal is to learn a programming language to develop software. Brian: I came into Year Up with a goal of starting my career as a network/security technician. As I learned more about that career choice, I started to distance myself from it because I realized it just wasn’t for me. When I heard about a QA bootcamp that a Year Up Instructor constructed, I was intrigued by how it connected to software development. Currently, I would like to stay in Quality Assurance to get acquainted with the SDLC and Agile Methodology. In the future, I would like to get some experience as a Software Developer. During your internship, were you assigned to any interesting projects that stood out? Crystal: I had the privilege to work with offshore developers in order to bring reusable code into a contect management system for future implementations. I was able to facilitate daily stand-ups, design meetings, and work under strict deadlines. Brenda: I was able to collaborate and work hands-on with an in-house application, reviewing and analyzing components before it was launched to customers. I was also able to participate in testing sessions, allowing me to provide feedback on current prototypes and designs. What are your interests/hobbies outside of work or school? Crystal: I’ve always found pleasure in art and poetry. I like to spend memorable moments with close friends at fun outdoor activities such as berry and tulip picking in the springtime and festivals during autumn. Brian: I love to create different types of things from software (editing a video or music, creating a game, or designing art on Photoshop). Bryan: I enjoy tough workout routines, technology, video games, and sports. Exploring and observing nature is a peaceful way to enjoy time, as well as eating or cooking a delicious meal! Brenda: I’m extremely passionate about front-end web development and graphic design. I taught myself how to use Photoshop when I was in high school and began making graphic, manipulations, websites, and typography posters. I also developed an interest in video editing and learned how to use Sony Vegas in early middle school. What are/were your favorite things about being a Year Up intern at Asurion? Crystal: The guidance, training, and experience that I received were the most significant things that have impacted my life. Brian: One unforgettable thing about being an intern at Asurion is the culture. I enjoy and respect the people I work with because they are so down to earth. Everyone is willing to help you on projects or simply give advice on how to be better. I enjoyed learning something new every day and did the best I could to ask for more work so that I could experience everything the internship had to offer. Another thing that stood out to me was the teachings on how to work in a corporate environment. I had to learn how to manage my own time, finish assigned projects, work with other teams, and mostly figure out how to solve problems. Bryan: I really enjoy the Asurion culture and office environment. I’ve met some amazing people in my time here, and I plan to meet many more. The various events that let coworkers bond and meld particularly stood out to me as an intern. Brenda: Year Up provided me with an amazing support system and allowed me to gain great communication skills, which helped me with networking and being able to start working on my first day at Asurion. Find out more about Year Up and how to apply here.